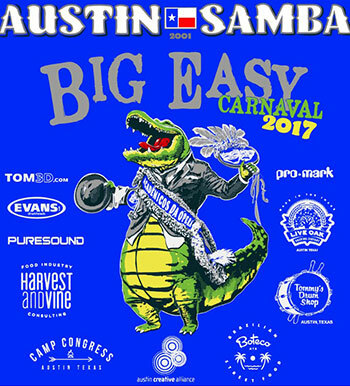 Austin Samba brings fifty performers and special guests to The Stateside Theater Stage for the “Big Easy,” where they’ll cook up a gumbo of classic New Orleans tunes simmered in Brazilian percussion and spiced with beautiful choreography. Enjoy a wild mash up of Louis Armstrong, Fats Domino, The Neville Brothers, Dr. John, Jerry Lee Lewis and Clifton Chenier that celebrates the irresistible joy of Mardi Gras and Carnaval with rhythms and dance from throughout Brazil. You’ll be shaking it from start to finish! Break out your masks, feathers, beads and dancin’ shoes. It’s Mardi Gras y’all. Laissez les bons temps rouler! !